Successfully Added IP66 Outdoor IP PTZ Dome Camera - 1/3 Inch Sony CMOS, Pan, Tilt, 4 Times Zoom, 60M Night Vision, 1080P, SD Card, Remote View to your Shopping Cart. The perfect tool for viewing wide areas such as parking lots, factories, school halls, warehouses, public areas, shopping malls and more, this 1080p PTZ IP camera can pan through 355 degrees and tilt up to 90 degrees so nothing can escape its view. With a 1/3 inch SONY 222 CMOS digital sensor this dome camera provides a clear crisp image at full HD resolutions and can pick out details even in low lit, dark areas. Able to see even at 0.05 Lux it is suited to cloudy overcast nights or dark locations. The cameras night vision has a range of up to 60 meters thanks to its 6 LED arrays, while the 2.8 to 12mm lens provides a 4 times optical zoom brining a closer view whenever it's needed, perfect for night time security needs. Having motion detection alarms that can be set up for 4 areas means that the camera can cover multiple zones securely and should it detect any unauthorized visitors you will be sure to know as it can send an email snapshot of the intruder and start recording their movements. This can be stored on a micro SD card and the H.264 image compression means that you should have plenty of space. The dome camera has support for mobiles phones so you can monitor the camera feed remotely on you Smartphone wherever you have a network connection, this is in addition to the browser support so even if you not on the premises you can keep informed of all that goes on there. 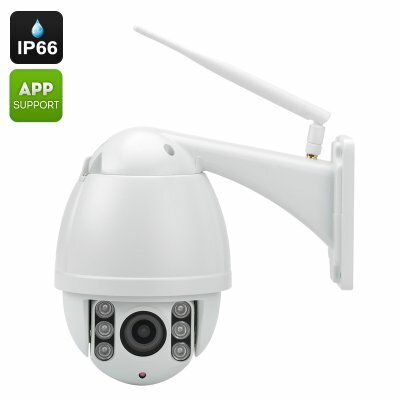 With an IP66 rating this IP security camera is suitable for outdoor use and what's more its Wi-Fi connectivity makes installation so much simpler reducing the limitations on where it can be located. This Outdoor IP66 PTZ dome camera comes with a 12 months warranty, brought to you by the leader in electronic devices as well as wholesale security cameras..
We are happy, for this price we get more what we accpect good choice.